Why do you look the way you do? Genetics is the study of inherited traits. Read, watch, and download the notes below to learn more about the study of genetics. Gregor Mendel, was a monk in Austria who raised peas in the monastery gardens. While breeding his peas, he made some big discoveries. They were discoveries about genetics. The peas had several traits he could see. Some plants were tall and some were short. Some had wrinkled pods and some had smooth pods. Some pods were green and some where yellow. The flowers were white or purple. Mendel looked at each trait and learned how they were passed down to the offspring plants. 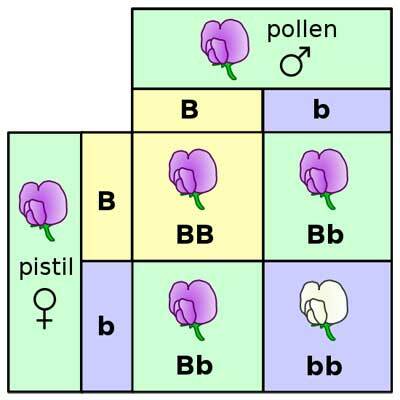 Since plants breed using pollen, Mendel controlled which plants pollinated other plants. This was how he discovered many important genetic rules. First he learned that some traits showed up more often and he called them dominant traits. The traits that showed up less often he called recessive traits. He discovered that if tall plants and short plants bred, they made a mixed or hybrid offspring plant. Hybrid plants are different from dominant plants even if they looked the same. Each gene has two chances at a trait - two copies or alleles. So a hybrid plant could be carrying the allele for a recessive trait even if you can't see it. So, for example, a hybrid plant might be tall like its dominant parent, but it still could have an allele for shortness that you don't see. When two tall hybrid plants breed, one in four of the offspring are short. This is a 3:1 ratio. Mendel saw this and it is still taught in basic genetics classes today. Purpose: To explore how Punnett squares are used to predict the outcomes of genetic crosses in flies. Directions: For each scenario, follow the directions to complete the Punnett square. When you have solved each Punnett square, fill in the required information for each one. After you are done with each scenario, click “Reset”. *Note, the scenarios are not given in the correct order (I don’t know why they’re not! ).